On May 19, 2018, the Emerald Isle Parrot Head’s hosted their 15th Annual Beach Bike Poker Run. With 242 participants this was the 2nd largest in history of the event. Each participant rode their bike or walked to the seven poker stops, drew a poker card, and tried to create the best poker hand possible. Congratulations to Lee Ott for buying his mulligan and coming up with four aces for the winning hand. He took home $300 in cash. 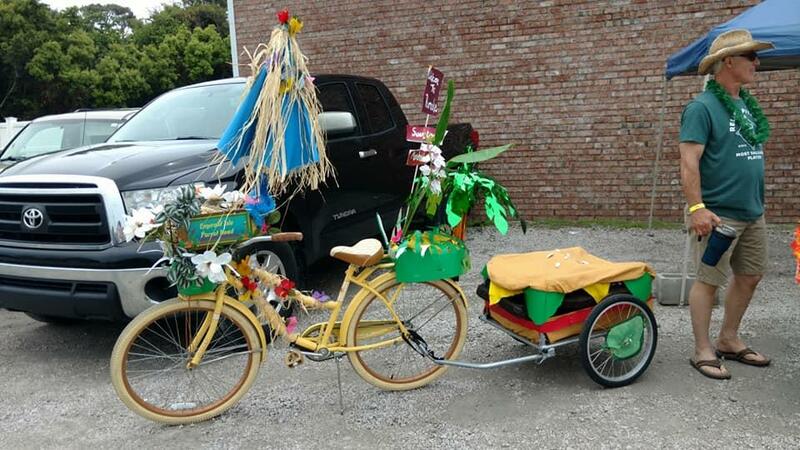 Aside from the poker hand competition, the Parrot Head’s also hosted a bicycle decoration contest. The creativity of the Parrot Head’s is second to none! The evening ended with a live auction. The giving hearts of the Emerald Isle community were magnified during our auction. This was the first year of the live auction and what a success it was, brining in $3000. Local The profits of this event were donated to the Semper Fi Fund Kids Camp. The camp allows children of injured service members of all branches from Carteret and Onslow counties to enjoy a week of personal growth and adventure. Following the week of camp, campers are paired with a mentor the year. This allows the continued growth of these children who have faces so much in their lives. 2018 was another record breaking year for the fundraising efforts of the Emerald Isle Parrot Heads. 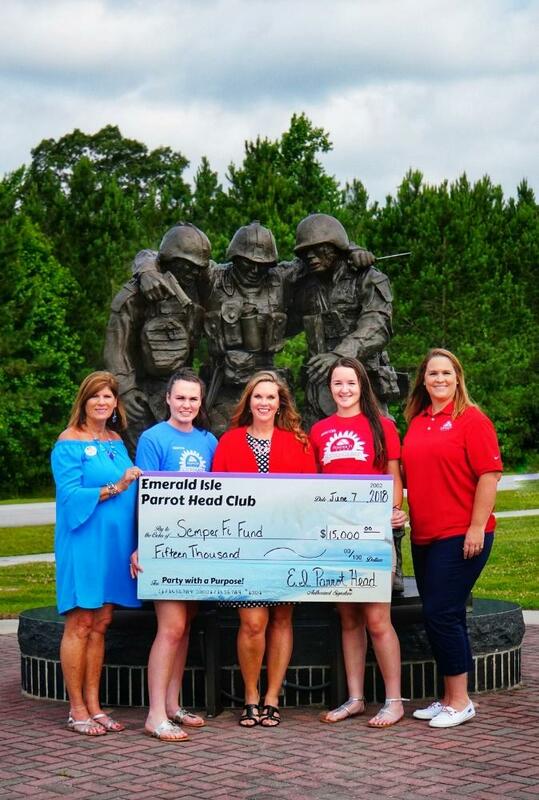 Through hard work, the generosity of our poker stops, sponsors and the kind-hearted members of the Emerald Isle community $15,000 was donated on June 6th to the Semper Fi Fund. Last year the Parrot Heads raised funds to cover the expenses of 21 campers and four mentors. In true Parrot Head fashion, we partied with a purpose! We are excited to see how many more campers and mentors this $15,000 donation will impact! Meeting of the Minds 2017 has come and gone with some wonderful memories remaining of all the great times we had down in Key West. I wanted to take a few moments during the holidays to recap the event and talk about what is ahead for 2018. Sorry if this is a long read but I want to thank many people for making everything happen this year! “We’re Still Here” was our event name this year and was a phrase that summed up the 2017 Meeting of the Minds event in general after Hurricane Irma came through Florida and left a path of destruction in many areas. We were there and thankfully Key West was spared major damage unlike many neighbors in most all other directions. The 26th Annual Meeting of the Minds was down in attendance a bit as some folks elected to stay home after a huge sell-out year in 2016 with the 25th annual happenings. Some of our people who wanted to come this year lost their accommodations up the keys and we missed you all! The 2017 concert schedule had Jimmy Buffett taking part of the band out to Hawaii for a show during MOTM and some of the normal MOTM crowd followed him out there… We did however have a nice crowd on hand and we all had a great time at the Casa Marina! Our crowd also filled Duval Street on Friday for two blocks solid as they enjoyed three great bands! Well, not exactly the midnight ride of Paul Revere, but the EI Parrotheads cleaned up by land and by sea on Earth Day 2017. 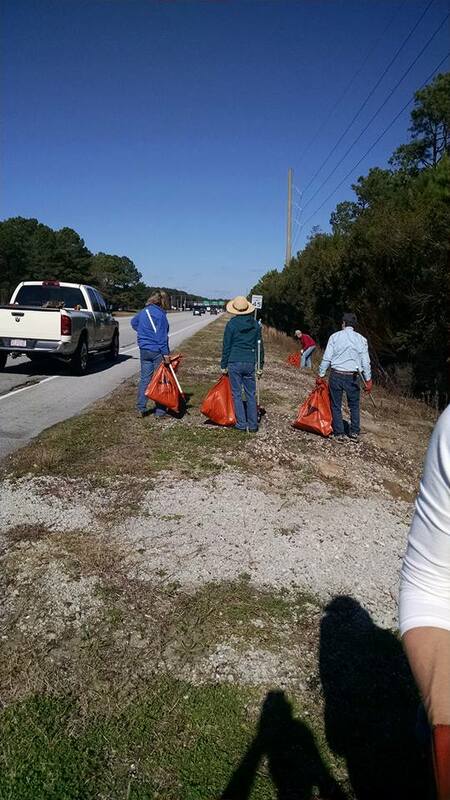 Over 3 dozen EI Parrotheads cleaned up NC 58 and the Intracoastal Waterway. It was a good deed and a great time! 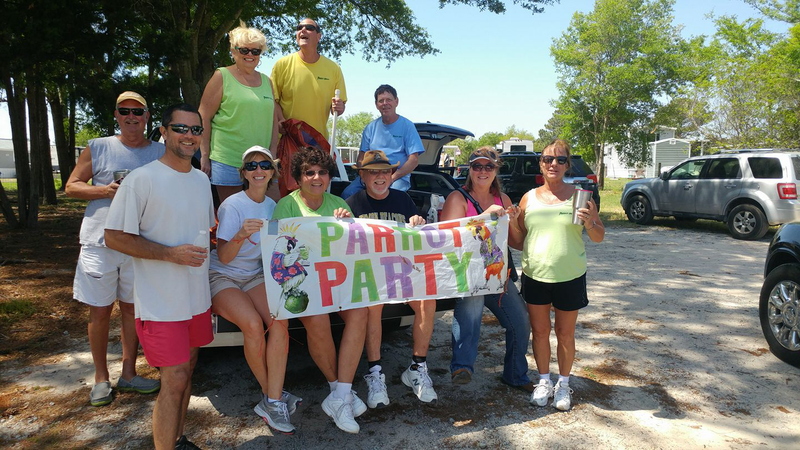 We then met on Pelican Island in Swansboro Harbor for hotdogs & fixin’s, organized by Val! 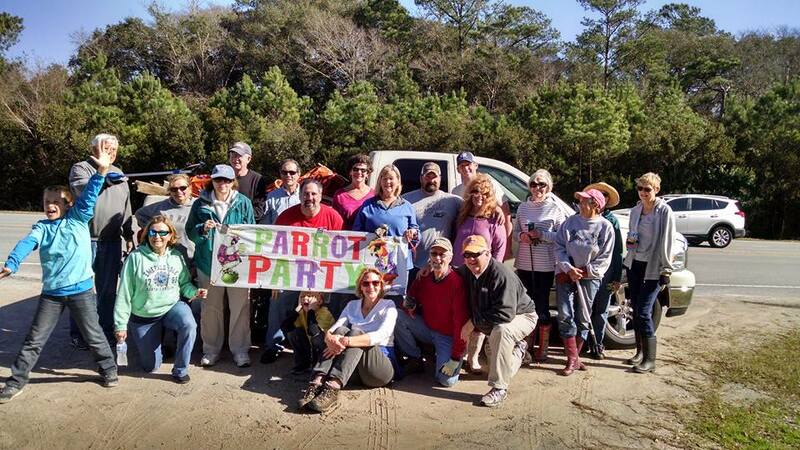 The Parrotheads had a large contingent at the annual Hoop Pole Creek Preserve nature trail cleanup on January 14th. This event is organized by the Coastal Federation, and helps to keep this 31-acre urban park clean and inviting. 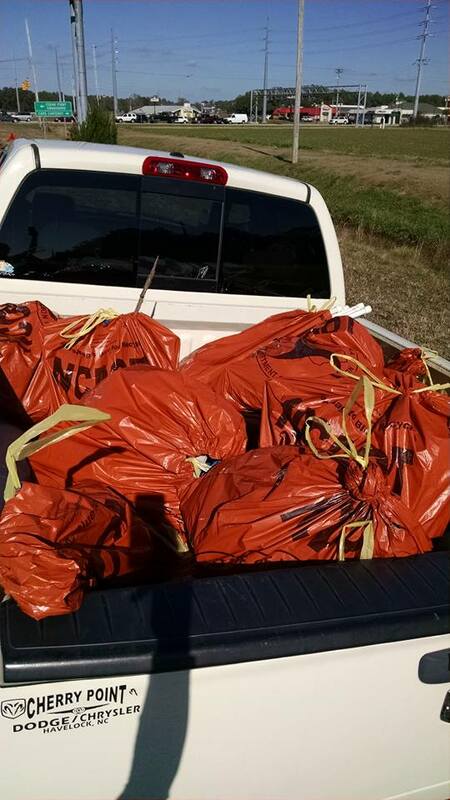 Approximately 20 Parrotheads met the Coastal Federation organizers at 10AM and fanned out along the trail and marshes, picking up several bags of aluminum cans, plastic bottles, plastic bags, styrofoam, drinking cups, and other trash. Our efforts, combined with the Coastal Foundation volunteers made short work of the litter, and we were finished shortly after 11AM. 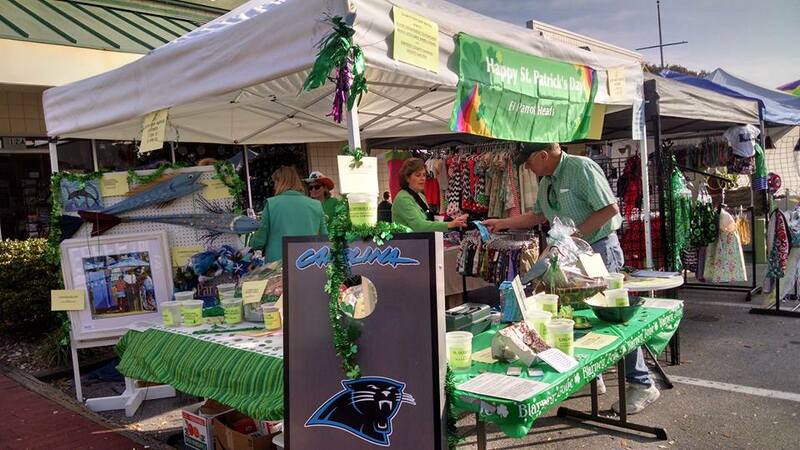 With a beautiful day on tap, our Parrot Head booth at the Emerald Isle St. Patrick’s Day Festival was a huge success. Parrot Head volunteers were decked out in St. Pat’s garb as they handed out info, hawked Riff Raff Raffle tickets, took in new members, and generally had a rowdy time. Jimi Crampton and Ken Stone took turns in the Party-on the Parrot suit bringing business into the booth and playing and getting their pictures taken with little kids. We had 18 great gifts to raffle off that were donated by Parrot Heads and supporting local businesses which allowed us to take in donations of $1750 that was all given to charity, the E.I. Fire Dept. to go towards handicapped beach wheelchairs and Protectors of Homeless Pets/the Humane Society. Many thanks to all who helped out and those who contributed to the raffles, and welcome to new members and returning members! 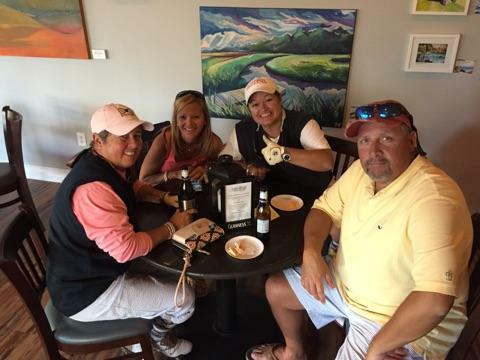 EIPHC hosted a mini golf tournament this past Sunday at Emerald Forest Putt Putt and an awards ceremony following at Carolina Wine Mixer. 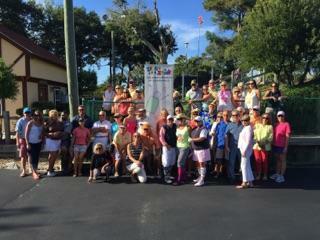 With over $600 raised and 44 participants, it was huge success with fun had by all. 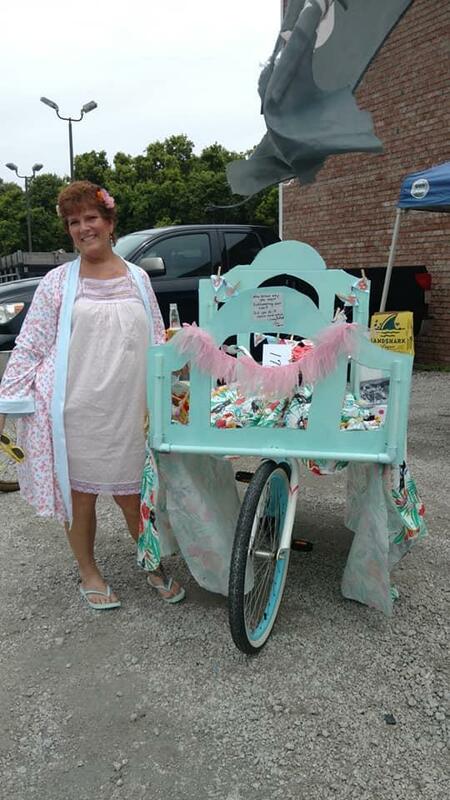 The fundraiser benefited the campaign for the Zing Zumm children’s museum of Jacksonville. A brief article/ photo will be featured in the Neighbors section of the Jacksonville paper this coming Sunday. Thank you all for your continuous generosity and support for our community!